I was recently introduced to Aspaeris Pivot Shorts. There are benefits to wearing Aspaeris. They promote injury prevention, increased performance and faster recovery. When I received my shorts, I thought there was no way they would fit me and that my friends 9 year old daughter could wear them. Luckily for me, they are not as small as they appeared. I ordered a medium and they fit perfect. I normally don't like my shorts too form fitting but these stayed in place, didn't give me a muffin top and most surprisingly - they were slimming. 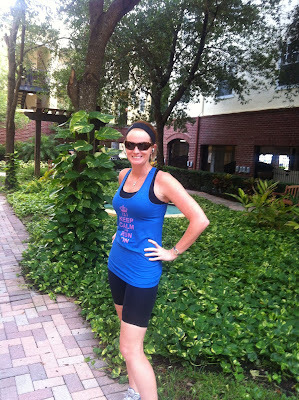 I paired my shorts with my Halftime Designs Keep Calm and Run On tank. I tested out the Aspaeris shorts out on a short run. We did 2 miles and I finally hit under a 9 minute mile. It was 8:59....but it was still under 9 minutes!! After 2 miles, the shorts were still comfortable, I didn't once have to pull at them. Aspaeris is technically two pairs of shorts bonded together. The Outer Short is a high performance compression short designed to support your muscles. The Inner Short features Dual Sensory Compression Bands™. Aspaeris Pivot Shorts™ are designed to keep signaling for your body to maintain proper position during repetitive motion. It helps adjust your legs and hips to avoid injury. Patent-pending targeted compression zones guide your knees into the proper position. I really liked the Aspaeris Pivot Shorts. I am going to have to order a red pair now since have two upcoming Disney races I am dressing up for. Tower of Terror 10 miler - I am dressing up as Jessie from Toy Story. Walt Disney World Half Marathon - I am dressing up as Minnie Mouse along with two of my friends. The red shorts will be perfect under both of my skirts! Now for the good part. I am giving away one pair of Aspaeris Compression shorts. The good people of Aspaeris is also giving $25 off of their shorts for my readers with the discount code ADVOCATE25! These shorts come in red, navy and blue and you can find them on their website here. You can also follow them on twitter @aspaerispivot. I love my compression pants! These look really nice. I hope I win! I have a bunch of compression - tights, socks, and shorts - and I love it all! Any you can never have too much, so I hope I win! I wear compression socks or sleeves all the time. Even to work on some days! I could not run without my compression shorts! Currently looking for a new pair, and these look like the best thing since sliced bread! They really are! Good luck! Ive tried the socks but never the shorts - fingers crossed! Me neither - I am getting a pair of the socks for my 10 miler in 2 weeks :) Good luck! Hi Meredith! You won the contest. I am sending you an email now. Congrats!! I wear compression shorts! Would love to try these! Oh! I want to try these so bad! Maybe they will help my piriformis! I bet it would help you out! Good luck!! Awesome! I am wearing these under my costume at Tower of Terror 10 miler in 2 weeks! I'm dressing up as Jessie from Toy Story! These look super cool!! I would love to try some! Let me know what you think of the socks! I do not but I'm interested in trying them! I wear compression calf sleeves after long runs, and I've been wanting to try out a pair of shorts for my sore quads. Would love to try these! I've been looking at getting sleeves or socks! I've been wanting to try compression shorts! My husband has a pair and swears they help his legs recover quicker... and you think they helped you run faster though?! Ha, now I def need my own pair! Yes! I think it made me faster. That or the wind that was pushing me ;) I will go with the shorts though! Awesome that you will be at TOT10! Are you dressing up? I wear compression shorts, but having lost a lot of weight, I've been looking to buy and try some new ones, I may have to try these! Congrats on the weight loss! These are great shorts, def. worth a try.